To know more, I recommend this blog article. It also explains how to rip securely..
1. 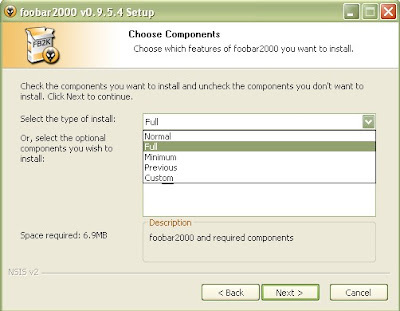 You can automatically retrieve the tag data from the FreeDB database, but it needs a component which is included in the full install of foobar2000. Run the installation file (foobar2000_0.9.5.4.exe) once again. Go Next, Accept, Next. Then chose "full" in the type of install. 2. If you want to rip in MP3, you will need the LAME commandline mp3 encoder. It's an exe file you can download from here. 3.Click the "Lookup" button to retrieve tag data. Some data should be found. Chose one line and click "Update files"
4. 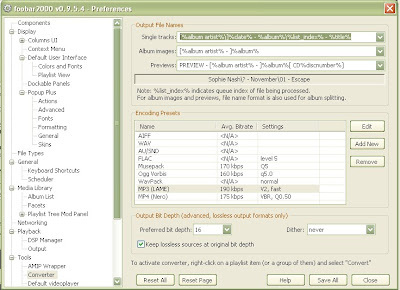 Click Rip, chose MP3 Lame as an encoder (or whatever you wish), and indicate to foobar2000 where you put the exe file extracted from the LAME zip (you will just have to this once).